alaTest has collected and analyzed 9 reviews of LG 65SK9500 Series. The average rating for this product is 4.3/5, compared to an average rating of 4.3/5 for other products in the same category for all reviews. We analyzed user and expert ratings, product age and more factors. 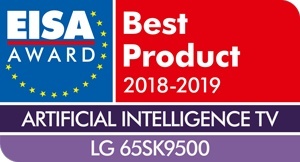 Compared to other products in the same category the LG 65SK9500 Series is awarded an overall alaScore™ of 95/100 = Excellent quality. The LG 65SK9500 Super UHD 65-inch is a great LCD TV with smarter-than-average features and support for theater-quality picture and sound. Fantastic picture, great sound and features to. Bought a week ago and absolutely delighted with everything this TV has to offer. Perfecte tv voor wie graag OLED wil, maar het nog wat te duur vindt.